An injury paradigm using the Drosophila larval ventral nerve cord to investigate central nervous system regeneration and repair is described. Stabbing followed by laser scanning confocal microscopy in time-lapse and fixed specimens, combined with quantitative analysis with purposefully developed software and genetics, are used to investigate the molecular mechanisms of CNS regeneration and repair. Kato, K., Hidalgo, A. An Injury Paradigm to Investigate Central Nervous System Repair in Drosophila. J. Vis. Exp. (73), e50306, doi:10.3791/50306 (2013). An experimental method has been developed to investigate the cellular responses to central nervous system (CNS) injury using the fruit-fly Drosophila. Understanding repair and regeneration in animals is a key question in biology. The damaged human CNS does not regenerate, and understanding how to promote the regeneration is one of main goals of medical neuroscience. The powerful genetic toolkit of Drosophila can be used to tackle the problem of CNS regeneration. A lesion to the CNS ventral nerve cord (VNC, equivalent to the vertebrate spinal cord) is applied manually with a tungsten needle. The VNC can subsequently be filmed in time-lapse using laser scanning confocal microscopy for up to 24 hr to follow the development of the lesion over time. Alternatively, it can be cultured, then fixed and stained using immunofluorescence to visualize neuron and glial cells with confocal microscopy. Using appropriate markers, changes in cell morphology and cell state as a result of injury can be visualized. With ImageJ and purposely developed plug-ins, quantitative and statistical analyses can be carried out to measure changes in wound size over time and the effects of injury in cell proliferation and cell death. These methods allow the analysis of large sample sizes. They can be combined with the powerful genetics of Drosophila to investigate the molecular mechanisms underlying CNS regeneration and repair. Regeneration in animals reveals that cells sense when organism growth is ordered and complete, and how structural integrity of an organism is achieved and maintained. Understanding these mysterious abilities of cells is of great interest in biology. Promoting regeneration is one of the key goals for medical neuroscience. In humans, the damaged central nervous system (CNS) does not regenerate. Rodent models of spinal cord injury are used to understand how cells respond to injury. However, ethical concerns, high costs and the slow life cycle of the animals constrain progress. The fruit-fly Drosophila is a widely used model organism in developmental biology and neuroscience. Thanks to its powerful genetic tools and short life cycle, Drosophila has recurrently led to the discovery of gene functions and gene networks with relevance for the understanding of humans and disease. There is abundant evidence of evolutionary conservation of gene function from flies to humans. Over recent years, several paradigms for nervous system injury have been established in Drosophila. Some consist of damaging peripheral nerves that run along the wing or axotomy of peripheral nerves, including sensory 1 and motor axons 2 . However, the peripheral and central nervous systems differ in many respects, and it is well known that in many animals the peripheral nervous system can regenerate whereas the CNS cannot. Thus, to understand CNS regeneration, direct injury to the CNS is more appropriate. 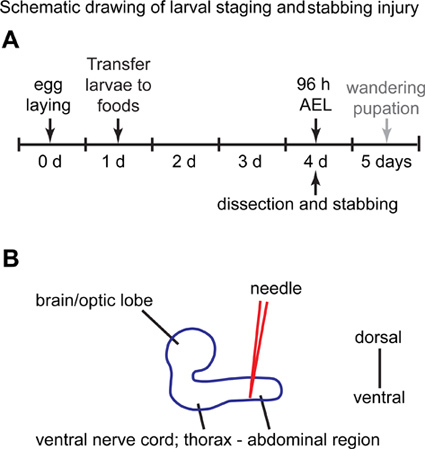 Stabbing injury with a needle has been successfully applied to the Drosophila adult brain to investigate the response to injury 3,4. Using another approach, Ayaz et al. severed CNS axons in cultured adult brains with a Piezo power microdissector, and analyzed their regeneration for 4 days 5. The advantage of these later experimental set ups is that they focus on the brain, which is undoubtedly of great interest. The disadvantage is that the brain is a lot more complex than the VNC, which deals only with motor and sensory control. Working on the adult brain is also more time consuming. The larva is ready for experiments in 4 days, whereas it takes about 10 days for adult eclosion, and then additional 5 days for their maturation. The adult brain is also more difficult to handle, because it is encapsulated in thick cuticle, which is difficult to remove. The VNC has the further attraction of being functionally equivalent to the vertebrate spinal cord. The Drosophila larva is widely used as a model organism for neuroscience 6-9. Although strictly speaking the larva is in a developmental phase, it can also be considered a fully functional animal. The larva has locomotion, multiple senses including olfaction, taste and nociception, and learning and memory. Thus, the larval VNC was chosen as the ideal model for CNS injury. Larval and pupal VNCs can be dissected and cultured in dish, still retaining cellular integrity for up to 24 hr 10. This suggested that injury could be applied to the VNC, which could then be recorded in time-lapse for over this period of time, or cultured and fixed at any desired time point within this period. Here, we present an experimental paradigm for CNS injury using the Drosophila larval VNC. The VNC is first dissected from the larva, and stabbing injury is applied manually with a tungsten needle. The VNC is then placed on a glass-bottom coverslip, and filmed with time-lapse laser scanning confocal microscopy. Alternatively, the VNCs can be cultured for a desired period of time, and the cellular effects of injury can be analyzed in fixed specimens using immunostaining and confocal microscopy. The wound area can be measured, and quantitative analysis of cell number (cell proliferation and cell death) can be carried out with purposely developed software. Large sample sizes can be easily handled, resulting in statistically validated results. These methods have been successfully combined with the powerful genetics of Drosophila to discover a gene network underlying the glial regenerative response to CNS injury 11. Place 15 female and 15 male adult flies in a cylindrical Perspex cage to lay eggs on a Petri dish with agar and grape juice supplemented with a small scoop of yeast paste for 3 hr at 25 °C. Change the plate 3-4 times a day, and discard the first plate (i.e. from the O/N egg-lay). Discard also the plates from the first day. From the second day on, keep the plates with eggs at 25 °C. After 7 days of collecting eggs, start with a new set up of parent flies. After about 24 hr, larvae hatch from the eggs. By hooking larvae with a thinned paintbrush or with a pair of forceps, transfer 35 larvae from the grape agar to a vial containing standard fly food (10 ml) (Figure 1A). Maintain the vials containing larvae for 3 days (96 hr After Egg Laying, AEL) at 25 °C. Clean bench and hands with 70% ethanol. Soak 4 staining blocks, 2 pairs of forceps and a needle with 70% ethanol, and let air dry. Prepare 4 staining blocks with the following media: one with Distilled Water (DW) to clean and to pool cleaned larvae; a second one with 2 ml of Shield and Sang M3 insect medium with 1% penicillin and Streptomycin, Ecdysone-free (M3 PS medium) to dissect the larvae; a third with 2 ml of M3 PS medium to pool dissected ventral nerve cords (VNCs); and a fourth with 2 ml of M3 PS medium to stab the VNCs. All of the reagents must be pre-warmed to RT. Add water to the vial containing 96 hr AEL larvae. Then, by using a spatula, gently spread food with larvae from the vial on to a wet paper towel. Transfer 10 larvae to a staining block containing DW to wash off the food. Replace DW 6 times. Then replace with M3 PS medium. Transfer one of the larvae to a staining block containing 2 ml of M3 PS medium. Do not pull or tear the imaginal discs and peripheral nerves from the thoracic VNC as this will damage the VNC. To cut the peripheral nerves, hold the peripheral nerves with two pairs of forceps placed close each other, and then pull the nerves with the forceps. Imaginal discs and mouth parts can be left attached to the VNC. Leave the ring gland and lymph gland attached to the brain. Cut the gut at the point closest to the brain, where not much food is contained. By using a P20 pipetman with the tip cut off and widened a little, transfer the VNC to a staining block containing fresh M3 PS medium. Before transferring the VNC, first pipette up and down only the medium used for the dissection in order to prevent the VNC from sticking to the tip. This section describes how to perform stabbing injury to the VNCs, and to prepare stabbed-VNCs for time-lapse analysis and immunostaining. Post-stabbing culture conditions and duration are described in section 5 (for time-lapse analysis) and in section 6 (for immunostaining). After pooling enough VNCs (4-5 for time-lapse and over 24 for immunostaining), transfer one VNC to a clean staining block containing M3 PS. Orient the VNC so that the dorsal neuropile is in view under the dissecting microscope (Figure 1B). This is the most natural orientation for VNCs to lie in when attached to the optic lobes. Stab manually using a tungsten needle under the dissection microscope, from the dorsal side virtually at a right angle and aiming for the abdominal half of the VNC (Figure 1B). Stab until the needle hits the bottom of the glass. However, be careful not to damage the needle tip. The stem of the needle holder must not touch the medium during stabbing. The wound is not visible under the dissection microscope. Rough surface, especially at the lateral/ventral area of the thorax, at 22 hr of stabbing. In extreme cases, the VNC looks protruded. Holes or vacuoles in the thoracic neuropile, which can be visible as holes in background signal with fluorescence immunostaining. Routinely check whether the needle tip is sharp enough. The needle tip can be bent or blunt after using it for several experiments. In this case, sharpen the tip using an Arkansas stone or equivalent. The tips of the forceps must meet perfectly. The tips can get damaged with use. In this case, adjust the tip using an Arkansas stones or equivalent. To visualize the axonal neuropile in the living VNC, a GFP protein trap line that labels all axons - G9 13 - can be used, and to visualize all glial cells (except the midline glia) the glial driver repoGAL4 can be used to express the UASdsRed S197Y 14 reporter. By crossing G9 flies to UASdsRedS197Y;;repoGAL4 flies, VNCs from progeny larvae are obtained with green axons and red glia that can be recorded in living tissue. After pooling 4-5 VNCs, transfer 1 VNC to a clean staining block containing 2 ml of M3 PS, and stab the abdominal half of the VNC as indicated in section 3. Transfer the stabbed VNC to a Poly-L-lysin coated 3.5 mm glass bottom Petri dish containing 1 ml of M3 PS. Place the VNCs dorsal side down. Gently push the VNC using the flat side of a pair of forceps to allow the VNC to stick to the dish. Gently add 1 ml of M3 PS 15% FBS rendering the final concentration of FBS to 7.5%. Acquire images using laser scanning confocal microscopy. Scan the VNC, collecting a Z-section series throughout its entire thickness. We used a Leica SP2 inverted confocal microscope with a temperature controlled environmental chamber. Any equivalent confocal microscope should work, however it may require optimization of the settings for the scanning. The settings for our time-lapse confocal microscopy were as follows: Temperature of environmental chamber: 25 °C; 20X objective with 4 times zoom; scanning mode xyzt, with 512x512 pixel resolution, z=1 μm steps and 1-hour or 2-hour intervals. The Leica SP2 confocal microscope has a limitation in file size for scanning. With these settings, 8-9 timepoints can be scanned. With other confocal microscopes, it ought to be possible to acquire image stacks for longer time points, i.e. over the span of up to 24 hr. Prepare a 24-well tissue culture plate containing 500 μl of M3 PS 7.5% FBS per well. Repeat dissection of more than 24 VNCs for a 24-well tissue culture dish. By using the P20 pipetman with the tip cut-off, transfer 12 non-stabbed VNCs from the pool to the culture dish, using 1 VNC per well. Stab the rest of VNCs in the pool as described in section 3. Transfer each stabbed VNC to a well each. Place the 24-well dish in the 25 °C incubator for a desired duration depending on the experiment. Cell integrity is unaltered for at least 24 hr. After culture, transfer the 12 VNCs in 250 μl of 4% formaldehyde PEM in a 1.5 ml tube by using the P20 pipetman with the tip cut-off. Then, the fixative is carefully pipetted out, taking care not to damage the VNCs. A small amount of fixative sufficient to cover the samples should remain in each tube. Subsequently, add fresh fixative, and gently agitate for 50 min at RT. Rinse 2 times with 0.3% Triton X PBS, and then wash 2 times for 10 min with 0.3% Triton X PBS at RT. Block VNCs by incubating with 10% normal goat serum in 0.3% Triton X PBS for 1 hr at RT. The samples can be stored at 4 °C for at least one month. Incubate VNCs with primary antibodies for more than 20 hr at 4 °C. Rinse 2 times with 0.3% Triton X PBS, then wash 3 times for 10 min with 0.3% Triton X PBS at RT. Incubate VNCs with secondary antibodies for more than 16 hr at 4 °C. Rinse 2 times with 0.3% Triton X PBS, then wash 3 times for 10 min with 0.3% Triton X PBS at room RT (in the dark if using fluorescent secondary antibodies). Replace PBS with 50% glycerol: 50% PBS for at least an hour. Then replace with 80% glycerol: 20% PBS for at least an hour. Mount a VNC in a window made on 2 layers of cello-tape (approximately 0.06 mm) on a microscopy glass slide. Adjust the orientation, and place a coverslip (18x18 mm) over the window. Two VNCs can be mounted on a slide using this method. Using a variety of primary antibodies, different cellular responses to injury can be analyzed (e.g. changes in cell number and cell shape). If the VNC does not have stabbing unrelated degeneration, the sample must be counted in for the analysis regardless of lesion size. As stabbing is done manually, the lesion size differs each time. Thus it is important to analyze statistically the effect of stabbing, whenever possible. Using ImageJ, open a stack of confocal images from "File" menu, select "Import" and from here select "Image sequence". This will turn the collection of individual images into a stack. Next change the "stack" into a "Hyperstack" by going to "Image" menu, select "Hyperstack", then select "Stack to Hyperstack". Set the voxel size by using "Properties" from "Image" menu. In data acquired using the Leica SP2 confocal microscope, the voxel size can be obtained from the scanning-software, and from the metadata text file saved together with images. With our setting as described in Section 3, pixel dimensions are xy=0.366211 μm and z=0.99709 μm. By examining all the slices in one time point, draw the maximum outline of the lesion area with the polygon-selection tool in the tool bar. This is the Region Of Interest (ROI). Add the ROI to the ROI manager by going to "Analyze" menu, scroll down and select "Tools", then "ROI manager", then "add". Repeat this for the all the time points. Click the "Measure" button in the ROI manager to obtain the area size of each ROI. Correction of VNC movement during time-lapse recordings. "Stackreg" and "Turboreg" plugins 16 (from the ImageJ website http://rsbweb.nih.gov/ij/): these plugins allow to correct small sample movements during time-lapse. Build a stack with an equivalent representative optical section through all the time-points and apply the plugins. It helps to visualize how the lesion changes over time. The details on these methods and the instruction manual are available from the research group that developed these plugins. (http://bigwww.epfl.ch/thevenaz/stackreg/). Automatic counting of glial cells. "DeadEasy glia" plugin (www.biosciences-labs.bham.ac.uk/hidalgo/Software.html): this was developed to count the number of REPO-positive glial cells in the Drosophila larval VNC and to examine the change in glial number caused by stabbing injury17. The plug-in works accurately, with an error of 0.1% false positives and 4.3% false negatives 17. To use this plug-in, first label all the glia (except the midline) in the specimen using immunofluorescence with anti-REPO antibodies. Then install the plug-in in ImageJ, open a stack of confocal images and run plug-in. It counts glial cells automatically in about 30 seconds. Automatic counting of apoptotic cells. "DeadEasy Caspase larvae" plug-in (www.biosciences-labs.bham.ac.uk/hidalgo/Software.html) 18: This was developed to count the number of cells labeled with anti-cleaved-Caspase3, and a new version was adapted for the larval VNCs. Stabbing injury causes an increase in programmed cell death 11. To use this plug-in, first label apoptotic cells in the specimen using immunofluorescence with anti-cleaved-Caspase-3 antibodies. Then install the plug-in in ImageJ, open a stack of confocal images and run plug-in. It counts apoptotic cells automatically in about 30 seconds. Culture medium: Shield and Sang M3 insect medium, 7.5% fetal bovine serum, 1% penicillin and 1% Streptomycin. 0.01% Poly-L-lysin in sterile DW. Fixative: 4% formaldehyde, Ultra pure in PEM (0.1 M PIPES, 2 mM EGTA, 1 mM MgSO4) solution. Blocking solution for immunostaining: 10% normal goat serum in 0.3% Triton X PBS. Anti-Glutamine Synthetase 2 antibodies: 1:250 in blocking solution. Anti-GFP antibodies: 1:1,000 in blocking solution. Anti-REPO antibodies: 1:250 in blocking solution. Anti-ELAV antibodies: 1:250 in blocking solution. Anti-cleaved Caspase 3 antibodies: 1:1,000 in blocking solution. Secondary antibodies: 1:250 in blocking solution. Here we show how to perform stabbing injury to the Drosophila larval VNC and analyze the cellular responses to injury using time-lapse and immunostaining confocal fluorescence microscopy. For time-lapse data, the lesion is visualized as a GFP-negative area within the neuropile of specimens bearing the G9 axonal marker (Figure 2). Shortly after stabbing, small GFP-negative areas, which look like holes or vacuoles, start to appear (Figure 2A). Such GFP-negative areas generally enlarge up to around 6 to 8 hr after stabbing (Figure 2A). Subsequently, the GFP-negative areas shrink and may even disappear (Figure 2B). By 22 hr after stabbing, the area occupied by the wound is generally smaller than the maximum area was at 6 to 8 hr after stabbing (Figures 2A, B). Similarly the DsRed-negative area in glial processes initially increases too, but shrinks by 22 hr after stabbing. Interestingly, often DsRed-positive glial processes fill the GFP-negative holes in the neuropile prior to their disappearance (Figure 2C). Using immunostaining in fixed specimens, fine glial processes and their response to injury can be visualized with better resolution than with time-lapse images. This can be done, for instance, using the repoGAL4 glial driver to induce the expression of a membrane tethered reporter (e.g. UAS-mCD8GFP) in flies to visualize all glial cells (except the midline glia). This can also be combined with other glial markers, such as anti-GS2, which labels neuropile-associated glial cells (Figures 3A, B). Here we show that although the ventral nerve cord is stabbed from the dorsal side, stabbing injury results in a dent ventrally (Figure 3A, arrowheads). Stabbing appears to affect more severely the neuropile and neuropile-associated glial cells than surface and cortex glial cells (Figure 3B). Glial processes appear disorganized in the neuropile, whereas they still maintain their mesh like organization in the cortex. Injury results in GS2-positive cellular debris, which is distinct from normal cells as debris fragments are much smaller and not connected to a cell body. This reveals damage to neuropile-associated glial cells (Figure 3B). Degenerating neuropile-associated glial cells were also observed by electron microscopy 15. Anti-cleaved-Caspase 3+ apoptosis staining is observed in neuropile-associated glial cells 15, showing they undergo apoptosis upon stabbing injury. Neuropile associated glial cells were also shown to phagocytose neuronal debris 15, and GS2+ signal might also reveal the engulfment of apoptotic neurons by glial processes. Cleaved-Caspase+ apoptotic cells are also observed in the cortex, at least some of which correspond to Elav+ neurons (Figure 3C). Using fixed samples and immunostaining also enables quantitative analyses of cellular responses to injury, such as effects in proliferation and apoptosis. For this, we purposely developed two ImageJ plug-ins, DeadEasy Caspase Larva and DeadEasy Glia, to count automatically the number of glial cells and apoptotic cells, respectively. They have been validated to work on larval VNCs and are very accurate. Using these, it is possible to observe an increase in the number of REPO-positive glial cells caused by stabbing injury, by 22 hr (Figure 4A)15. There is also an increase in the number of anti-cleaved-Caspase-3 apoptotic cells by 6 hr post-stabbing (Figure 4B)15. Such increase in glial proliferation and apoptosis in response to injury in the Drosophila CNS is reminiscent of the injury response in the vertebrate CNS. A crucial aspect of this protocol is the quality of the VNC dissections. It is difficult to tell at the time of dissection whether the VNCs have been damaged or not in the process. It is important to take particular care to perform gentle dissections. However, bad quality samples will inevitably be produced, and it is essential that these are identified at later stages and discarded. In our hands, VNC degeneration appears to be unrelated to injury, but instead caused by rough dissection. We have not observed a critical size in the injury wound, and we analyze all injured samples that are not degraded. When VNCs maintain their integrity, the VNC surface tends to look smooth and shiny, and no holes in the neuropile are observed (Figure 5A). Degradation of VNCs can be recognized by 24 hr post-dissection from the rough surface of the VNC ventral and lateral areas (Figure 5B). Degradation of the neuropile unrelated to stabbing injury can also occur, and it is recognized as neuropile holes in the background signal of immunostained specimens. Samples with these signs of degeneration must be discarded (Figure 5C). In our hands, the success rate for dissection and injury in intact and stabbed control (yw) flies are both around 70%. This rate will vary with the skill of the person performing the experiments, and with the genotype. Figure 1. Schematic drawing of larval staging and stabbing injury. (A) At day 0, flies are allowed to lay eggs in a grape juice Petri dish for 3 hr. At day 1, the hatched first instar larvae (L1) are collected and placed in vials containing standard yeast food, where they are kept for another 3 days. At day 4, larvae are collected from food vial, and used for the stabbing experiments. (B) Lateral view of the larval central nervous system. The abdominal region of the ventral nerve cord is stabbed with a needle from the dorsal side. Anterior is to the left, and posterior to the right. Figure 2. Time-lapse progression of VNC lesion. Confocal microscopy on live VNCs with GFP-labeled axons and DsRed-labeled glial cells. Genotype: UASDsRed/+;G9/+;repoGAL4/+. (A) The lesion is recognized by the lack of fluorescence on the axonal neuropile. After stabbing, GFP-negative holes appear, thereafter increasing in size and number. Projections of 5 optical sections from each time point after stabbing injury. (B) The axonal neuropile lesion shrinks from 9 hr after stabbing. These images are single optical sections from different time points after stabbing injury. To identify equivalent positions in each sample, the same slice number from each time point in the stack of time-lapse data was chosen. By comparing the patterns visualized with G9 and repoGAL4>UASmCD8GFP in the area not affected by the stabbing, the slices were verified as being from equivalent positions in the Z axis. Dashed lines in (A,B) indicate the edge of the wound. (C) High magnification of wounds on the neuropile. GFP-negative holes were filled with DsRed-positive glial processes, and subsequently disappeared (arrowheads). Horizontal view. Anterior up. Figure 3. Cellular characterization of VNC lesion. VNCs bearing a membrane tethered GFP reporter for all glial cells (except midline glia) stained with anti-GFP and anti-GS2, a neuropile-associated glial cell marker. Genotype: +/+;UASmCD8GFP/+;repoGAL4/+. (A) VNCs were stabbed from the dorsal side, but this causes a dent ventrally (arrowheads). Sagittal view of single optical sections, dorsal up and anterior left. (A, B) Stabbing injury affects more severely neuropile-associated glial cells than cortex and surface glial cells. Injury results in GS2-positive cellular debris (arrowheads in B). (B) Horizontal view of single optical sections, anterior up. Arrowheads point to GS2+ cell debris. (C) Colocalisation of the apoptotic marker anti-cleaved-Caspase-3 and the neuronal marker anti-Elav showing that upon injury some of the dying cells in the cortex are neurons. np, neuropile; cx, cortex. Figure 4. Automatic counting of glial cells and apoptotic cells using DeadEasy. (A) Example of using 'DeadEasy Larval glia' to count REPO positive glial cells. Left: VNC ventral halves stained with anti-REPO antibodies; middle: output from DeadEasy Larval glia showing cells identified by the plug-in; right: merge. The numbers on the right are the number of REPO-positive cells counted automatically in an entire stack of optical confocal sections in about 30 seconds. The number of glia increases in the stabbed VNCs. (B) Example of using 'DeadEasy Caspase larva'. Left: projections of 5 optical confocal sections stained with anti-cleaved-CASPASE 3 antibodies; middle: output showing cells identified by the plug-in; right: merge. 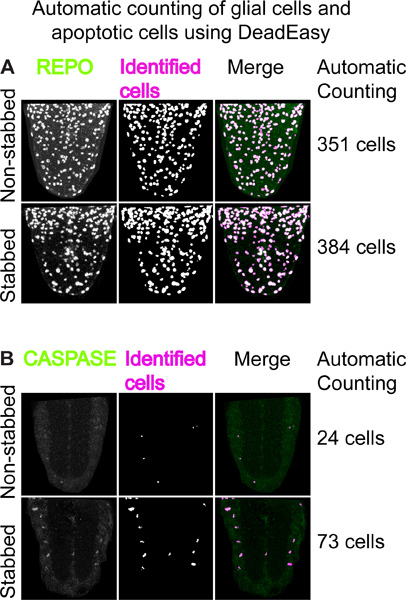 The numbers on the right are the number of CASPASE-positive cells counted automatically in an entire stack of optical confocal sections in about 30 seconds. The number of apoptotic cells increases in the stabbed VNC. Figure 5. Examples of degeneration. (A) A healthy VNC. There are no signs of degeneration. (B) The side of the thorax is degenerating (arrowheads) in a stabbed specimen. Asterisk indicates lesion site. (C) Holes in the thoracic neuropile (white arrowhead) and cortex (orange arrowhead) in a non-stabbed VNC. Specimens with damaged neuropile and extensive vacuolization must be discarded. Here VNCs were stained with the neuropile associated glial marker anti-Ebony. Horizontal view, anterior up. We have established a protocol for stabbing injury to the Drosophila larval CNS to investigate the cellular responses to injury, repair and regeneration. Larval VNCs are dissected and stabbed, after which they are filmed with time-lapse microscopy or fixed for fluorescence immunostaining to visualize glia and neurons, apoptosis or cell division. The progression of the lesion over time can be measured. This method is accompanied by purposely developed software for the quantitative and statistical analysis of cell number changes upon injury and during repair. We stabbed 96-hour AEL larvae (and these were either fixed or allowed to develop further), a developmental stage prior to the transition to pupa and then adult fly. At 96 hr, VNCs are large enough for stabbing; they are in the middle of third instar stage, and thus are not undergoing pupation yet; and the nervous system is already fully functional similar to that of the adult. It might be possible to stab slightly later in larvae and the precise timing must be chosen to suit the research question. However, depending on the questions addressed, it will generally be necessary to culture the VNCs for some time to observe the cellular responses to injury. Some time after 120 hr AEL pupation starts, a period when the CNS is remodeled and is thus best avoided. Thus the time window for stabbing plus culture in the larva is rather restricted. Using larvae still has a great technical advantage over using adults: whilst, similarly to the adult, the nervous system is already fully functional, analyzing the response to injury is considerably easier and faster in larvae. When comparing the size and morphology of brains and VNCs dissected and cultured in a dish to VNCs that are dissected at an equivalent later time point without culturing in a dish, it appears that development is slower in culture than in vivo. In other respects, development carries on normally in culture, tissue integrity is preserved and cells are alive showing multiple responses. Wound expansion, neuropile repair and glial proliferation take place within 22 hr post-stabbing. This shows that cellular responses to injury take place in culture and there is most likely no need to maintain the explants for longer than a day. If longer term culture were desired, the protocol may require further optimization such as using a culture plate insert5. It is important to identify good quality samples from the degenerating ones. Optimizing this protocol takes some skill and inevitably degeneration will occur in some specimens. The VNC can acquire a 'cauliflower' appearance that reflects a breakdown of tissue integrity (Figure 5B). Degeneration is also recognized by the vacuolization of the VNC independently of the stabbing, which can be present in intact, non-stabbed specimens (Figure 5C). These samples must be discarded. Degeneration is most likely caused by rough dissection, which can tear nerves and the protective layer of surface glia. Thus great care must be taken to dissect gently. Other influencing factors include the culture medium, which must be kept clean and with antibiotics, adhering strictly to the washes and timings as indicated in the protocol. Finally, the length of the needle and needle holder, size and sharpness of the needle are very important. The needle holder can contaminate the culture medium and a blunt needle can cause a large injury that cannot repair itself and will lead to degeneration. It is important to routinely maintain the needle sharp. In this protocol, we took advantage of a protein trap line of flies to visualize the neuropile in parallel to the visualization of glial processes using the traditional GAL4-UAS system. These tools could also be combined with other binary expression systems such as the LexA 19 and Q-system 20, which are independent of GAL4. This would enable the analysis of interactions for instance between axons and glial processes, in response to injury. By further combining it with other genetic tools such as reporters for dendrites 21 or calcium influx 22, this method provides a great opportunity to analyze the cell biology behind the injury response of glial cells, neuronal axons and dendrites in the CNS. Finally, this method can be combined with standard genetics, mutations and over-expression of genes, to test gene function in responses to injury and regeneration. This protocol has successfully led to the discovery of a gene network underlying the regenerative glial response to CNS injury 11. Given the evolutionary conservation of gene function, unraveling these cellular events and gene functions in fruit-flies is likely to provide significant insights into the understanding of mammalian CNS response to injury and regeneration. We thank Mei Ann Lim for critical reading of the manuscript and other members of our lab for their discussions throughout the course of this work. This work was funded by Yamada Science Foundation and Royal Society Short Visit Fellowships and EU Marie Curie International Incoming Fellowship GRR to K.K., and BBSRC Project Grant (BB/H002278/1) and Wellcome Trust Equipment Grant (073228/Z/03/Z) to A.H.
Fang, Y., Soares, L., Teng, X., Geary, M., Bonini, N. M. A novel Drosophila model of nerve injury reveals an essential role of Nmnat in maintaining axonal integrity. Curr. Biol. 22, 590-595 (2012). Xiong, X., et al. Protein turnover of the Wallenda/DLK kinase regulates a retrograde response to axonal injury. J. Cell Biol. 191, 211-223 (2010). Leyssen, M., et al. Amyloid precursor protein promotes post-developmental neurite arborization in the Drosophila brain. EMBO J. 24, 2944-2955 (2005). Kato, K., Awasaki, T., Ito, K. Neuronal programmed cell death induces glial cell division in the adult Drosophila brain. Development. 136, 51-59 (2009). Ayaz, D., et al. Axonal injury and regeneration in the adult brain of Drosophila. J. Neurosci. 28, 6010-6021 (2008). Rohrbough, J., O'Dowd, D. K., Baines, R. A., Broadie, K. Cellular bases of behavioral plasticity: establishing and modifying synaptic circuits in the Drosophila genetic system. J. Neurobiol. 54, 254-271 (2003). Babcock, D. T., Landry, C., Galko, M. J. Cytokine signaling mediates UV-induced nociceptive sensitization in Drosophila larvae. Curr. Biol. 19, 799-806 (2009). Gomez-Marin, A., Louis, M. Active sensation during orientation behavior in the Drosophila larva: more sense than luck. Curr. Opin. Neurobiol. 22, 208-215 (2012). Schleyer, M., et al. A behavior-based circuit model of how outcome expectations organize learned behavior in larval Drosophila. Learn Mem. 18, 639-653 (2011). Brown, H. L., Cherbas, L., Cherbas, P., Truman, J. W. Use of time-lapse imaging and dominant negative receptors to dissect the steroid receptor control of neuronal remodeling in Drosophila. Development. 133, 275-285 (2006). Kato, K., Forero, M. G., Fenton, J. C., Hidalgo, A. The glial regenerative response to central nervous system injury is enabled by pros-notch and pros-NFkappaB feedback. PLoS Biol. 9, e1001133 (2011). Sullivan, W., Ashburner, M., Hawley, R. S. Drosophila protocols. Cold Spring Harbor Laboratory Press. (2000). Morin, X., Daneman, R., Zavortink, M., Chia, W. A protein trap strategy to detect GFP-tagged proteins expressed from their endogenous loci in Drosophila. Proc. Natl. Acad. Sci. U.S.A. 98, 15050-15055 (2001). Verkhusha, V. V., et al. An enhanced mutant of red fluorescent protein DsRed for double labeling and developmental timer of neural fiber bundle formation. J. Biol. Chem. 276, 29621-29624 (2001). Kato, K., Forero, M. G., Fenton, J. C., Hidalgo, A. The glial regenerative response to central nervous system injury is enabled by Pros-Notch and Pros-NFkB feedback. PLoS Biol. 9, e1001133 (2011). Thévenaz, P., Ruttimann, U. E., Unser, M. A pyramid approach to subpixel registration based on intensity. IEEE Transactions on Image Processing: A Publication of the IEEE Signal Processing Society. 7, 27-41 (1998). Forero, M. G., Kato, K., Hidalgo, A. Automatic cell counting in vivo in the larval nervous system of Drosophila. J. Microsc. 46, 202-212 (2012). Forero, M. G., Pennack, J. A., Learte, A. R., Hidalgo, A. DeadEasy caspase: automatic counting of apoptotic cells in Drosophila. PLoS One. 4, e5441 (2009). Lai, S. L., Lee, T. Genetic mosaic with dual binary transcriptional systems in Drosophila. Nat. Neurosci. 9, 703-709 (2006). Potter, C. J., Tasic, B., Russler, E. V., Liang, L., Luo, L. The Q system: a repressible binary system for transgene expression, lineage tracing, and mosaic analysis. Cell. 141, 536-548 (2010). Nicolai, L. J., et al. Genetically encoded dendritic marker sheds light on neuronal connectivity in Drosophila. Proc. Natl. Acad. Sci. U.S.A. 107, 20553-20558 (2010).